Moonjee is an interesting web tool to play with your face picture. Just provide your face image and start playing and creating – the way you want. 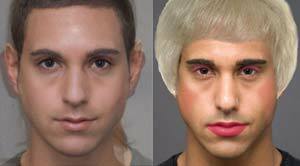 You can make face ugly, un-even by inflatingÂ andÂ stretching different parts of the face. 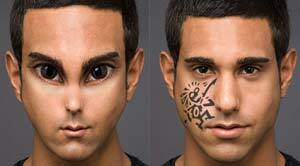 Make your face cool by adding a artistic tattoo on it. Besides, you can also blend and morph faces. Add different elements like a new hairdoo for virtual makeover of your face in few simple clicks. Overall, Moonjee is very good because of its unique effects on offer and focus on face images. Test drive Moonjee to create interesting variances of your face image. This is a free service but you need to register a free account to use it (big turn OFF)! $1 = Rs1, Adsense Goofup Exchange Rate Figure ! I am going to a trivia night with my friends, and the theme is to look like aliens. But we needed something to really help us win the costume prize, so we made our faces just like the ones above and are printing them and using them as masks! GREAT WEBSITE. This is really a cool tool – I used Funphotor earlier but this is bit exciting than that. Cool find.